Are you looking for a fun and exciting technology cross-curricular project geared toward middle/high school students? With Professor B's Lights, Camera, Action! 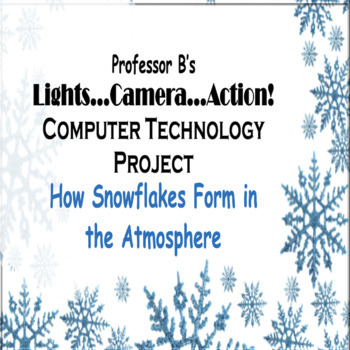 Middle/High School Technology Project "How Snowflakes Form in the Atmosphere", students incorporate english/language arts, drama, math, music, science, and technology classes to learn how snowflakes form in the atmosphere. Technology apps may include but not limited to GarageBand, iMovie, and Action Movie. This project can use alternative applications like Audacity, Soundation, ClipChampCreate, etc. In the project, students learn about the chemical reaction that makes leaves change color in the Fall, write a poem/haiku or short story about what they have learned, record a dramatic reading of their work, compose a music soundtrack, and use computer technology apps to create an engaging movie project. Student Task/Check List Sheet that clearly defines objectives/expectation. Unleash your students' creativity with Professor B's Lights, Camera, Action! Middle/High School Technology Project - How Snowflakes Form in the Atmosphere. Let the fun begin!